Enjoy this pie with all the components of a cold cut sandwich! Mix all ingredients together in a small bowl until a dough forms. Divide in half. Press half onto the bottom and sides of a standard pie dish. Prick lightly with a fork. Prebake crust for approximately 10 minutes. Spread the other dough half on a sheet of parchment paper, to fit the top of the pie. Set aside. Finely chop the deli you’re using and set aside. Remove the pie crust from oven. Combine mayo and mustard together and smear evenly over the crust. Layer onion, tomatoes, sauerkraut, red pepper, green pepper, salt and pepper, and chopped pastrami. Top with a generous drizzle of ketchup. Cover with reserved pie crust. Pinch edges to seal. Prick top with a fork. Top with a generous drizzle of ketchup. Cover with reserved piecrust. Pinch edges to seal. Prick top with a fork. 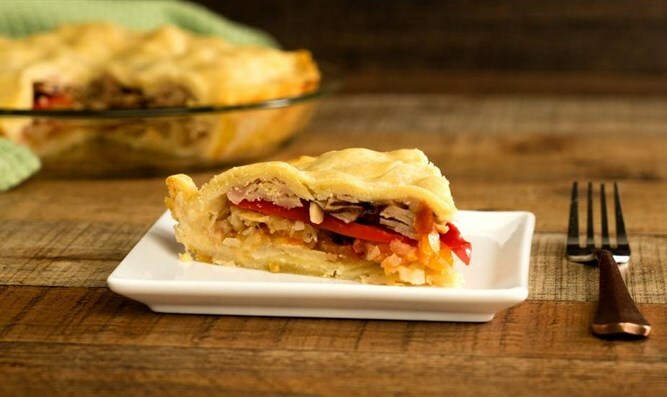 Bake the pie for approximately 30 minutes, or until golden and veggies are soft. Let sit at least 15 minutes before serving. It’s easiest to cut this pie when totally cooled. You can also make this in individual mini pie/muffin tins.